Well my husband went to a fishing tournament this weekend with Corey up on Big Stone Lake to fish the border walleye challenge, they left on Thursday and came home Saturday night. Yes, believe it or not they won! They got 7th place out of 100 by catching their limit of 6 walleyes and a total weight of 11.04 lbs. They received $500 for 7th place and then Corey won a drawing for another $50 so all together they ended up with $550! Way to go boys. Now it is fishing like this that I can handle, I told Jon he could go again and again if he comes home with money like this every time. The grand prize for 1st place was $2000 and the guys who won that had 6 walleyes and 14.08 lbs so you can see it was a close tournament and they were not far off from 1st place. The funniest thing about this whole story is that Jon got sooooo excited about the fishing that he forgot to wear sunblock and he is as red as a tomato!! His feet are going to have blisters from getting so sunburned. I do feel sorry for him! Well yesterday was a special holiday, can anyone guess what it was? Yep, that's right it was the annual Kingswood Rummage Sales!!! My best friend and filled up with gas the night before, hooked up her trail and planned to meet for coffee and donuts at the wee morning hours before the fun started. We got into Sioux Falls by 7:45am (sales opened at 8am) unhooked the trailer and we were off. It was AWESOME!!!! We got lots of good sales! I got a couple of bargains for th e day, one was a patio table and 4 chairs brand new for only $100, it was in great condition and the reason the lady sold it was because she said her deck was too small for the set......good thing we brought that trailer! After that buy being super excited we were off to find more bargains. Marty found an inter tube to pull behind the boat at the lake, it was a 2 seater and it had a bottom so the kids could not fall out, she swiped up that deal for only $40! The only other things I want to brag about are I found a Louis Vuitton purse and wallet for only $15. And another house this lady owned a store and so she was selling al l of these kids clothes brand new they were still on the hangers and the price tags were still on. She was selling anything I could find for half off. I found Trevor 6 Osh Kosh outfits for ONLY $3 each...YIPPEEE I love getting deals (Look at picture). I am also going to post some pictures of what it is like down there for everyone that makes fun of us for going. I am not the only redneck who brings a trailer AND I took a picture of people who stopped to lay down and take a nap on someone else's grass!! (Notice that in some of the pictures they even have porta potties so you do not loose your parking spot to go and find a place to go to the bathroom) I am telling you that this is one thing that you MUST partake in if you do not already! Oh my gosh I can hardly believe this myself but I have just enrolled Trevor in swimming lessons. Isn't it amazing how time flys? My little baby is going to be 2 in less then 2 months, scary!! Swimming lessons in Brookings start for kids when they are a year old. I enrolled him in the class that starts in mid July and goes for a month. We meet every Monday and Wednesday from 6:00-6:30pm at the SDSU pool. I am very excited about this because the class just gets the kids warmed up with the idea of water and goes through a few basic steps to swimming. I can not wait because Trevor is going to go nuts!!! He LOVES water, he is a little fish. They say that most kids are to afraid to even go in or near the water, well that will not be a problem for my son. I will have to put a leash on him because he will go flying by everyone and jump right in! Brookings is a great community for kids because they have so many things for them to be involved in. I can not wait, how exciting!! It is only the little things in life that matter. Like this picture, Trevor is soooo happy with his new bike that I bought him at a rummage sale for only a QUARTER! If I were to go to Wal-Mart and buy this bike it would be at least $20 but this little guy does not even know the difference! I LOVE to rummage you can find so many deals for so little money. Most people are just so prompted to buy everything new and it has to be from here and I have to admit at one time I am sure that I was like that but once you have kids it is only moments like this that matter. He is so happy and he does not care how much it was all that matters is that it works. We are getting to the season again for rummage sales and it excites me to no end!! Well it was another weekend. Friday night I had to work and so my mom and dad came over to entertain Trevor for awhile and then we had a camp fire at Greg's house. Then on Saturday Jon went Turkey hunting in the morning (yes he has picked up Turkey hunting now with his bow) then he went fishing with my dad on Hendricks in the afternoon. That evening we were invited to my aunt Betty's house for a little get together and supper. It was nice to see some of my family again and visit with my grandma because most of the time I only see her for the big holiday's and most of those days there are so many people I do not get a chance to see everyone. Anyways my aunt Betty and her husband Gary used to live in California and moved back about 2 years ago and they bought an acreage by Madison. In the move they brought there 5 horses with them and holy smokes Trevor loved to go and watch them . So then my aunt gave him something to feed them and he thought this was even better. We had a great time and we even made it home before the big storm hit. I got this picture in an e-mail and I thought it was cute and wanted to share. Have a good Friday and great weekend! Alright so I have a quiz for the people who think they are smart. It is funny how most kids make up words when they are trying to tell you that they want something. Like for instance about 4 months ago Trevor came up to Jon and I when we were standing in the kitchen and said "bagone" Jon and I just looked at each other and said "Trevor what did you say" he holds his fingers out in front of him and said "Mommy, Daddy Bagone"! After about 20 minutes we figured out what it meant.....can you guess what Bagone means? Come on Jennifer you are the smart one! !~ I will post the answer later. ANSWER: A Popsicle, how that is the same thing is beyond me! Alright so to start the story we will go way back....about 3 weeks ago Brookings started there curb clean-up, this means anything that you have and you want to get rid of it just put it on your curb and the city will pick it up and get rid of it for free. So many people in the town take advantage of this and just load up there curbs with tons of stuff. The joke about the whole deal is, many people will drive around and go curb shopping because one man's junk is another man's treasure. Cars will be driving very slow down the road so they can shop while driving (I am also guilty of this)....no laughing!!! I have found lots of things from a br and "new" queen sized headboard to a flat screen TV that just needed a cord and lots of other cute things. Anyways yesterday my brother was curb shopping and came along these big flags that some kids might put on there bike or whatever toy that they have. (My brother and I used to have one on each of our big wheels) So Greg went home and put both flags that he found on Trevor's wagon. When we got home yesterday Trevor got out of the car and said quote "WOW mommy look!! WOW!!" He loved them, all night long he either pulled the wagon around or we pulled him in it. It is just hilarious to see this pimped out wagon, so last night Jon named it the "pimp mobile"
Well we had another fun and exciting weekend. Friday night there was a carnival at the Hendricks Gym for kids of all ages and so we decided to go. Let me tell you Trevor had a BLAST! He was running none stop for hours. They had the blow up toys to jump on and those were his favorite....we could not get him to stop or even to take a break. As you can see in some of the pictures he is laughing so hard and with all the other kids jumping on it he could not get up. It was just hilarious to hear him laugh that hard. After we finally got him to take a break we went and did some other things. He went crab fishing, sand dollar fishing and actual fishing. He won lots and lots of prizes. We were there 3 hours and he still wanted to keep going but thank goodness they were closing down. But overall it was a great time and I am glad that we went. Well this post is for auntie Jennifer & uncle Chris since you are so far away and only get to see pictures I thought it would be fun to do something different. Trevor has really changed in the past few months. He has become really smart and he says certain things like it is no big deal and so I thought Jennifer and Chris would like this. The other night I videotaped Trevor reviewing his animal sounds and then we have been working on saying Grandpa Dennis and he said it all!! He does such a good job with this, his speaking skills are amazing. He can also count to 3 and if you ask him how old he is going to be he says "two mommy" and then holds up 2 fingers. I will videotape that for you next. But for now please enjoy this because this little guy is growing up way to fast. Well remember when I said that we had a very busy weekend? I was not kidding!! Here are some more pictures of our weekend. This slide show is of the Healy Easter Dinner on Saturday night. We got to together at Dennis and Diane's house and made Kumla for dinner and had Easter Cake with pink frosting for dessert. Trevor then had to take a bath from the frosting all over and getting soaked because he was playing in the kitchen sink full of water. We then hid Easter eggs for Trevor to find around the house, which he did very good at except for when he would shake the egg and all the candy would come flying out. But he thought that was really funny!! Great Grandma gave him eggs with cars and trucks in them and boy did he like those, he still hangs on to them day and night. Last night I went to check on him after he had went to sleep and there was his new yellow truck in his HAND! We had a fun weekend although it was very long. We went to the circus, we went to the circus!! Sunday The Shrine Circus was at the Brookings Swiftel Center for 2 shows one was at 2pm and the other was at 6pm, we went to the late one. It was so much fun, we ate lots of cotton candy and popcorn and drink lots of pop. Trevor had a blast! !He got to ride the ponies and the big elephant, he was smiling ear to ear the whole time. You would think that he would be scared of something.......like big animals or things in general but as of right now he is a dare devil!! Grandpa Dirk helping Trevor ride the pony. Hang on Grandma!! Look at that boy smile! Most of you would think that this little cutie pie is related to me since I had the same last name but you are wrong. When we lived at our home on Yorktown Circle Lucas and Trish Pearson were our neighbors.....how ironic is that. When we first moved in and saw the mail box we thought the builder of our home messed up because the address was wrong but it had my maiden name on it. As we had come to find out that was the last name of our neighbors and I was NOT even related to them....weird!! Anyways they got pregnant and Logan was supposed to be born after we came back from our Florida trip, this made me happy because I wanted to be there to meet this little person. Things had changed and Trish got a job in Sioux Falls working for Aramark so they found a house in Brandon and moved before he was born. The neighborhood was never the same again! Logan was born in November and I was super excited because we did not leave for Florida for another week so I finally got to meet the little sweetie. 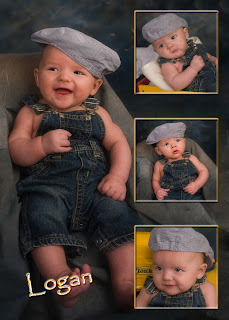 Now he is 4 months old already, Trish sent me his 3 months pictures and I just had to post them. 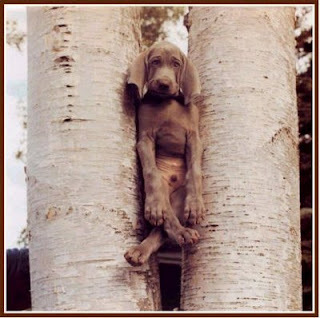 We miss our neighbors all the time and wait for them to move back....hee hee! I will stop changing the template I promise. I have been trying out new ones and I just can not find one that I like so we are back to what we started with. Thanks for being patient. Well it is official Jon and I now have a big boy and not a baby. When Trevor was little he had a hard time with different kinds of formula and we finally found that soy formula was the thing for him. As time went on and as we were coming to an end with formula we tried a few times switching to whole milk but it did not go so well. It would cause really bad tummy aches and he would just get really crabby so the doctor told us to keep him on soy formula until he was 2. Well that is coming r ight up this June so lately we have been trying to switch him over little by little hoping that things would work out this time. As you can see from the pictures things went well!! He loves milk only if he can drink it from a big boy glass. So last night during supper he wanted milk so I gave him some in a glass and he would drink from it for like 3 minutes at a time and milk would run down his tummy but this was grand fun. It got to be a little too fun because he found out that you can see through the bottom of the glass once it is close to empty and holy smokes was that funny. So now Jon and I now call him our big boy because he can drink milk from a big boy glass! Best Pancake Maker in town! Well my little bean woke up Sunday morning and wanted pancakes!! He loves pancakes he eats more then I ever thought he would be able to. So we got all the ingredients out and started to make pancakes. After putting the mix, oil, egg and milk together Trevor was more then excited to start stirring. He LOVES to stir things!! When we go out to eat he will get his spoon and stir the ice and water in his glass. When he takes a bath we need to have a pot and spoon in the tub for him to stir, I a m telling you next to loving water this kid loves to stir. So anyways I set him on the counter and let him stir the batter. He cracked me up the whole time because he was concentrating so hard that his mouth was wide open and tongue sticking out (just like his dad would do). He stirred for a good 15 minutes and then when it came time to make the pancakes it was "wow mommy look" as I put them on the griddle. Once we were finished with breakfast he was mad because he wa nted to still stir so I added some water to the messy bowl and let him continue to stir, within 20 minutes it was all over the floor. So if you are ever in need of a great pancake helper feel free to give Trevor a call. Well today is April Fool's Day, I was going to post something to get everyone worked up but then I decided not to since the rumor would probably spread faster then lightening. I was going to say that I was pregnant and all that jazz but then I thought I would probably give a few people a heart attack so I decided against it. I hope everyone had a good day and at least played a joke on one person. I have attached a link of "The top 100 April Fool's Hoaxes of all time" some are acually kind of interesting have a look for yourself.